Description: This used Enfield by Albion No 2 Mk I revolver is chambered for the .380 Enfield round. During wartime production this Enfield was manufactured by Albion. 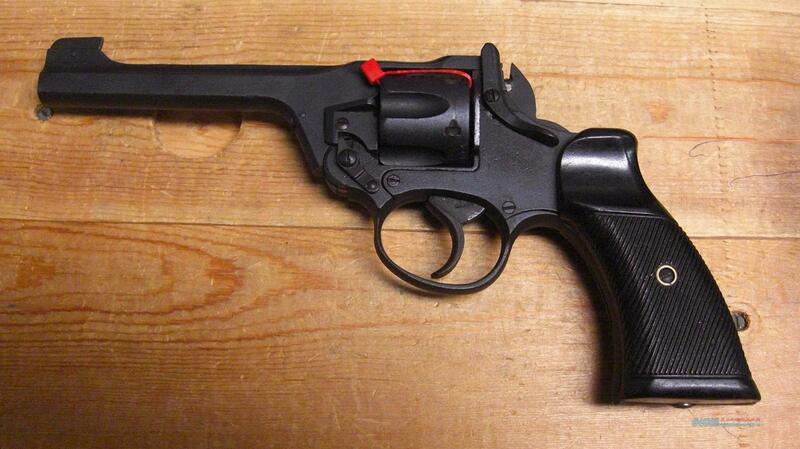 This revolver has a 5" barrel with an overall black/parkerized finish. Made in England in 1943, this revolver is a top break design that holds 6 rounds. The 1943 date of manufacture is on the frame just under the model. This gun has a 3/4"x3/8" divot out of the base of the plastic grip. It a scuff mark in the metal at the base of the grip frame as well as a scuff mark on the screw in the metal in the same location. The serial number on the frame, the base of the barrel, and on the cylinder all match.